Researchers identify the role mitochondria plays in familial ALS. A healthy motor neuron needs to transport its damaged components from the nerve-muscle connection all the way back to the cell body in the spinal cord. If not, the defective components pile up and the cell becomes sick and dies. 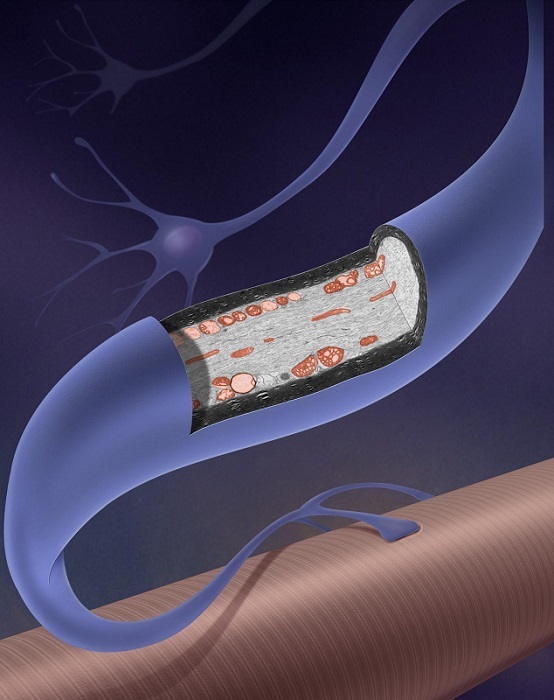 Now, a new study from researchers at the NIH’s National Institute of Neurological Disorders and Stroke (NINDS) has shown that a mutation in the gene for superoxide dismutase 1 (SOD1), which causes ALS, leads cells to accumulate damaged materials. The team states that their new study suggests a potential target for treating this familial form of ALS. The opensource study is published in the journal Neuron. Previous studies show that more than 12,000 Americans have ALS, also known as Lou Gehrig’s disease, and roughly 5-10 percent of them inherited a genetic mutation from a parent. These cases of familial ALS are often caused by mutations in the gene that codes for SOD1, an important enzyme located in the neuron’s mitochondria, the cell’s energy-producing structures. This mutation causes the death of motor neurons that control the patient’s muscles, resulting in progressive paralysis. The researchers explain that about 90 percent of the energy in the brain is generated by mitochondria and if the mitochondria aren’t healthy, they produce energy less efficiently; they can also release harmful chemicals called reactive oxygen species that cause cell death. They go on to add that as a consequence, mitochondrial damage can cause neurodegeneration. In healthy neurons, earlier studies show that storage containers called late endosomes collect damaged mitochondria and various destructive chemicals. A motor protein called dynein then transports the endosomes to structures called lysosomes, which use the chemicals to break down the endosomes. The current study shows that this crucial process is faulty in nerve cells with SOD1 mutations because mutant SOD1 interferes with a critical molecule called snapin that hooks the endosome to the dynein motor protein. The results show that snapin functions as an adaptor to link the dynein protein to the endosome for transport. The lab observed that when the snapin function is blocked, the endosome is stuck and the lysosomes lose their ability to destroy damaged mitochondria. The current study used a mouse model engineered to have an ALS mutation in their SOD1 genes. Using light and electron microscopes the data findings showed a buildup of damaged mitochondria in the mutant animals’ motor nerve fibers. The team note that this accumulation was present even in early stages of the disease before overt symptoms emerged. The data findings showed that snapin attaches dynein to the endosomes via a part of the protein called the dynein intermediate chain (DIC). In spinal cord motor neurons from the affected mice, the team found that the altered SOD1 binds to the DIC and prevents snapin from doing so. The lab found that increasing the amount of snapin in these neurons during the early, asymptomatic stage of the disease corrected the problem and reduced the buildup of defective mitochondria. Results showed that this helped the motor neurons to survive longer and slightly increased the animals’ lifespans. This also slowed down the loss of motor coordination, which worsens in animals with the SOD1 mutation as motor neurons die. The group state that they have provided a new mechanistic link that explains why mutant SOD1 impairs endosome transport. They go on to add that this can provide a cellular target for future development of early therapeutic interventions when motor neurons may still be salvageable. To the team’s knowledge this is the first study in the ALS research field to examine endosome transport in cultured motor neurons taken from adult mice models rather than from mouse embryos. The researchers surmise that by using adult motor neurons from the mice models, they found this transport defect. The team go on to conclude that this model may be useful not only for studying ALS but also other adult-onset diseases that cause neurodegeneration. Cellular garbage causes neurons to break down. A genetic mutation linked to ALS prevents motor neurons (pictured above) from getting rid of defective parts. Courtesy of Sheng Lab, NINDS.